I really did yeah. I had to melt lots of spoons. Is that a bit cruel? It’s definitely a bit dangerous. LOL that is for being such an annoying spoon! Finally! Revenge! is a dish actually best served hot. ooh love the blush, spoon! He’s meltiiiing! Pauline is awesome. As always. The paper and cardboard is nearly all recycled, apart from some fancy origami papers I’ve bought and certain colours of card which never turn up in the recycling bin. The first couple of Spoons I used were recycled, but I bought a big bag of plastic spoons when I decided he was going to keep coming back. So basically, a bit of both. I can tell you who’s definitely NOT recycled though… Doctor Bandaid. That Spoon is waaayy too hot! Ouch. Low blow, Pauline, low blow. Pauline is just too ruthless, man. So Phillipa, how do you melt spoons? How dangerous is it? Can you get serious injuries? Is spoon a he or she? Ooo!! You tell him Pauline! 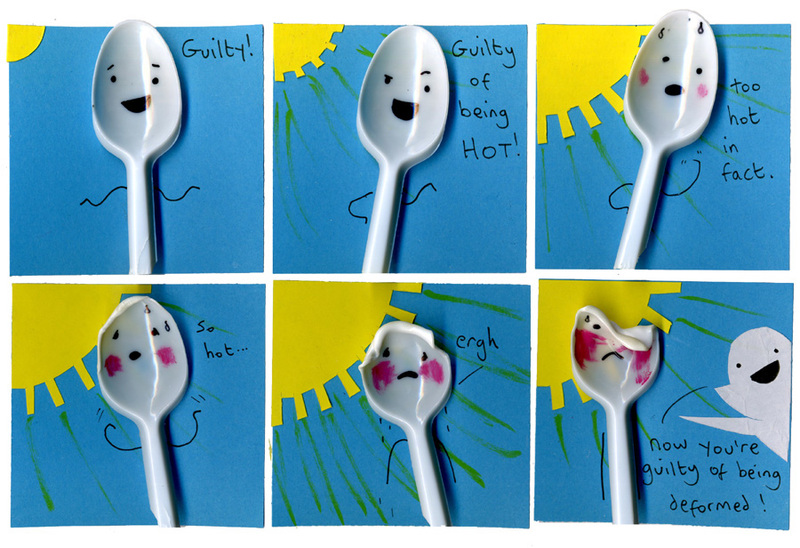 Spoon, you’re so mean, you kinda deserve it. Oh dear! You look really, really hurt! *calls 911* There, I hope you feel better soon Spoon!